NOBU InterContinental Hong Kong continues its GOURMET TOUR OF JAPAN 2017 with Episode 4: “Like Kobe, Love Wagyu”, a tribute to acclaimed Kobe Wagyu Beef. N ow through August 27, NOBU InterContinental Hong Kong's Executive Chef Sean Mell and Executive Sushi Chef Kazunari Araki present a la carte selections at lunchtime and a 7-course Omakase Dinner Menu highlighting Kobe Wagyu beef, renowned for its flavour, tenderness and well-marbled texture. To enhance this premium product, the chefs have incorporated charcoal from Kishu as an ingredient in the 7-course Kobe Beef Omakase Dinner Menu (HK$1,688 per person + 10% service). Click here for the Authentic Kobe Beef Omakase Dinner Menu. Click here for the à la carte Kobe Beef Lunch Menu. 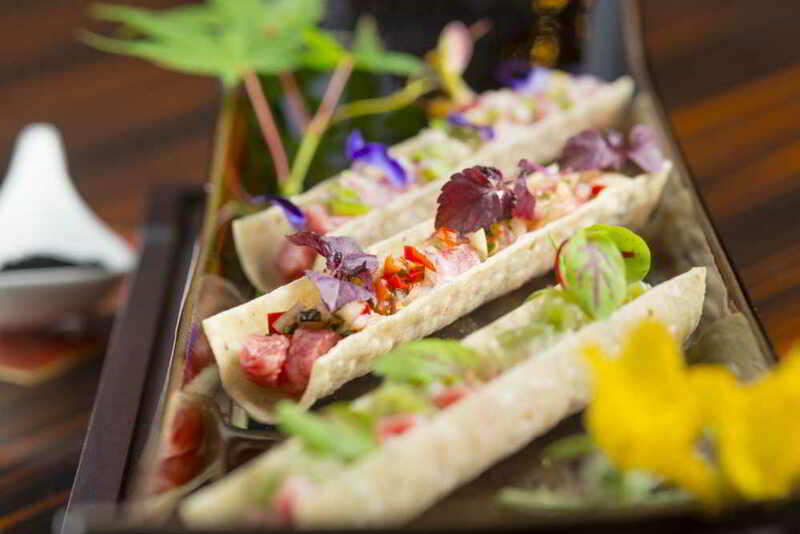 Also new at NOBU is the new Osusume menu which includes a selection of innovative, colourful summer dishes, exclusively available at NOBU InterContinental Hong Kong. Click here for the new Osusume à la carte selections (available on the dinner menu). The highlighted Hokusetsu Sake of the season is Junmai Gohyakumangoku, Nama Genshu 純米吟釀 五百萬石, 生原酒 (Available now through September 30). To experience a range of exclusive Hokusetsu sakes, try the Premium Sake Pairing Package at HK$500+10% service per person. Throughout the year Executive Chef Sean Mell and NOBU Executive Sushi Chef Kazunari Araki are guiding food lovers through Japan's prefectures. The culinary journey began in Okinawa in the southern region in January /February, and then headed north to Kyushu in March/ April and up to Kyoto in May/June. Now the gourmet tour continues in Kobe, as the chefs showcase innovative dishes with Kobe Wagyu Beef in July/August. NOBU InterContinental Hong Kong is open daily for lunch from 12 noon - 2:30pm and dinner from 6:00pm - 11:00pm. NOBU Afternoon Tea is served from 2:30pm – 4:30pm on Saturday and Sunday.